I don’t need to tell you to make time for Victoria Falls on your trip to Africa—considered one of the Seven Wonders of the World, Victoria Falls is likely already on your bucket list (and it’s just as beautiful as expected!). But did you know there are two entirely different ways to experience this must-see destination? If you’re short on time, you can make it a quick 1- or 2-night stop and stay in a nearby city hotel before departing for your next destination. I’ve done this, and it was great: you get easy access to Victoria Falls and it’s easy on the budget. 1. Keep the Safari Going! Did you cry when you left your safari camp? Don’t worry, you aren’t the only one. At a Victoria Falls river lodge, you will get to see more animals! 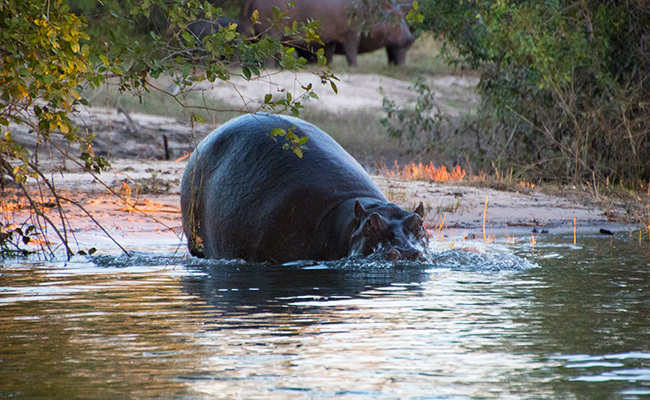 Large numbers of hippos, elephants, warthogs, crocs, monkeys, and even giraffes. You can view them from a safari vehicle, a boat, or take the traditional mokoro canoe out for a personal touch (this is a great option if you don’t have the time or budget for an Okavango Delta safari, where the mokoro is an iconic part of the experience). 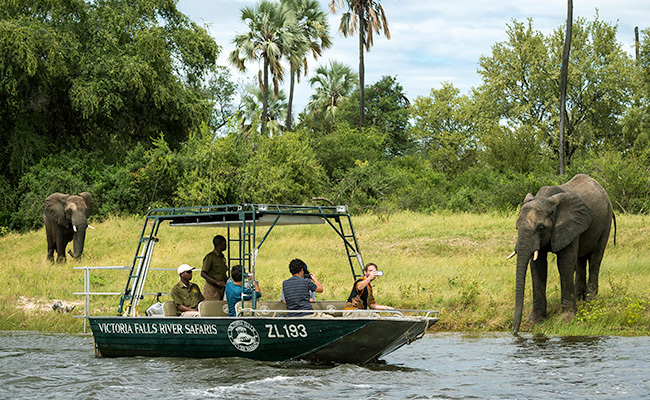 Your guide will get you close, but not too close, to the hippo pods and drinking elephants. You don’t want to do a sunset river cruise with 60 other people, you say. So, how does a small, luxury boat with your drink of choice sound? You depart before sunset and watch the crocs mudslide into the water, the hippos waking and yawning, before you pull onto your own private island with a beach bar built to suit. You watch the sky light up in pinks and reds as the sun dips below the horizon, just you and a select few lodge guests. You can’t beat that! Maybe you already got your fill of animals and beautiful sunsets. There are so many other activities you can do in and around Victoria Falls! A few things I did: enjoyed massages at the spa, biked to a nearby village and toured the area, visited a wildly successful local school, and went for a run through the wilderness. You can also visit Devil’s Pool, go whitewater rafting (both of these activities are offered in the dry season), go fishing on the Zambezi River, or tour the local markets. Thanks to its central location, Victoria Falls tends to fall in the middle of a safari itinerary. On your safari (at least, on any Africa Endeavours safari), you will be staying at small, intimate camps with a great deal of privacy and personalized service. It can be a little jarring to go from that boutique feel to a larger city hotel. But a Victoria Falls river lodge will provide the same safari-style comfort, white glove service, and attention to detail, making your entire journey as seamless as possible. 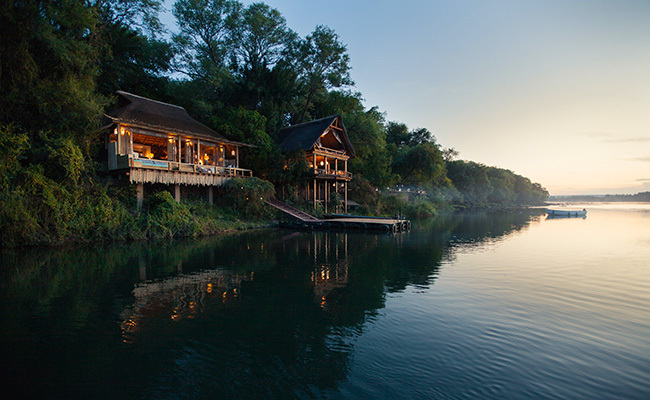 During my South Africa, Victoria Falls, and Zambia safari, I had the opportunity to stay at Tongabezi Lodge—a gorgeous lodge on the banks of the Zambezi River—and The Islands of Siankaba, which is actually located on two private islands in the middle of the river, joined together by walkways and swing bridges. Staying at one or both of these lodges is sure to provide an unforgettable Victoria Falls experience! However, there are dozens of options, depending on which style of lodge and activities you prefer. Get in touch and I’d be happy to recommend the best Victoria Falls safari lodge for you! 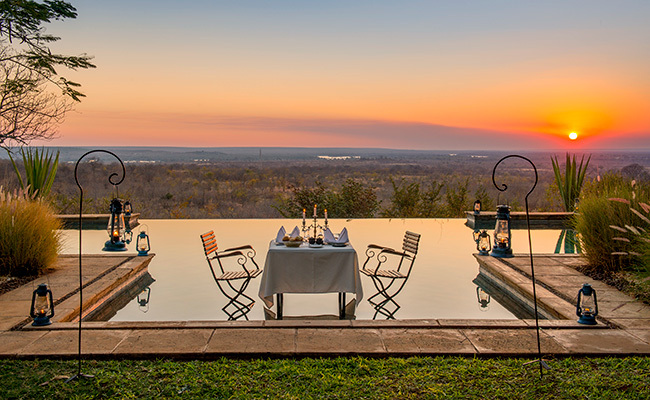 Need some help choosing the best Victoria Falls river lodge? Give me a call at (888) 367-0933 or email me at ltober@africaendeavours.com!